What could be more basic to life on Earth than mud and straw? The dirt beneath your feet brings forth grasses that become straw. When you combine these two elements with loving care you can create an enduring beauty that will thrill your soul, and a home that will embrace and protect you. We have been experiencing a renaissance in the use of natural materials for building throughout the U. S.
I know several builders who have pretty much dedicated themselves to honing their skills in combining natural materials. This article will focus mostly on the work of Talmath Mesinbrink and his adobe floors. He and Paul Koppana have cooperated on several building projects, but there are many other fine craftsmen and women doing admirable work. Paul (SkyHawk Construction) has specialized in straw bale building and Talmath (MudCrafters Construction) has specialized in adobe floors, earthen plasters and clay paints. “I have always liked to play in the dirt,” Talmath mused, “making mud castles and filling buckets with clay.” This led to studying pottery with Bertha Gotterup and experimenting with clay sculpture. His love for getting his hands dirty, and the years of trailing around with his step-dad, Mike Dennett, helping out on construction projects, has naturally led Talmath to making a vocation of this sort of work. Now he can play with the dirt to his heart's content while making a living. About eight years ago Talmath partnered with Jonathon Bruce and Eric Maki to study the fine art of making adobe floors and applying mud plasters to walls. At this point Talmath was mostly employed to mix the right ingredients in a wheelbarrow. You need to add about 25% of finely screened clay to 75% sharp sand or crusher fines, with enough water to make something the consistency of a thick cake batter. Once this is thoroughly mixed, then several handfuls of chopped straw (several inches long) can be mixed in to help bind the material together and give the final floor some beautiful flecks of gold if desired. This wet mixture is poured over a prepared base of thoroughly tamped road base (gravel and sand). The layer of adobe can be as thin as about ¾ inch, but usually it is more like about 2 inches. The first stage of pouring an adobe floor is similar to pouring concrete, where the wet material is roughly screed to get it uniformly level. With concrete, however, you must do all of the finish work within a few hours, before it sets up. With adobe the curing and finishing process can go on for weeks, or even months. Once the initial pour has been leveled and troweled to get it roughly smooth, and it firms up enough to carefully put weight on it, the process of reworking the adobe with a steel trowel to press it further can begin. The reason for this is partly to force the pour into a monolithic mass, because the clay will shrink as it dries and form a network of cracks that must be sealed. Other reasons to press the surface of the adobe is to harden it for durability, and to bring the clay content to the surface where it can be polished (or burnished) to a lustrous finish. Talmath prefers to pour the adobe over in-floor radiant heat tubes, so that he can control the rate that it dries out; this can hasten the completion of a project by several weeks. It is possible to add thin layers of pure colored clay to the surface, and work this to a fine polish. Such a coating is called an elise, and this makes the process even more of an art form. The elise can be a swirling mix of colors, each of natural origin. Talmath says he is always on the lookout for colorful clays that can be mined to produce the particular nuance of tone that he is looking for. He will often create several test swatches of finished adobe to show a client before he starts a job. It is also possible to add oxides or stains to the adobe to get a desired color. Pressing an adobe floor is very hard back- and wrist-breaking work. It must be done on the knees, with a lot of force and a specific technique to get the desired result. Talmath says he will wear out a steel trowel over the course of just few jobs, through the friction of working the soil. As the adobe dries out, it can be moistened with a spray of water to make it possible to continue to trowel it. The work is as much by feel as by look. 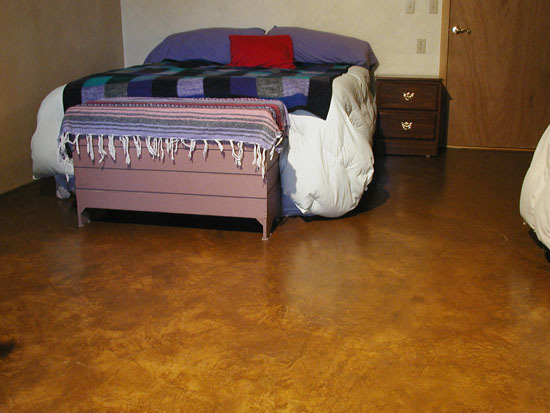 Once everyone is satisfied with the degree of finish, and the floor has completely dried, it can be sealed with several coats of oil and other finishes. Usually the first coat is pure boiled linseed oil that has been heated to allow it to penetrate further into the adobe. Successive coats of linseed oil thinned with odorless mineral spirits are then applied until saturation is achieved. A final finish coat of hardening oil (such as fruit, nut and tung oil) can polish it off. High traffic areas might receive a final coat of hard oil wax to further protect the floor. Pouring an adobe floor is usually the very last aspect of a construction job, since the floor cannot be disturbed while it is curing. Those doing the labor usually go out on the floor with stocking feet, so as to not mar the work. The result of all this labor can be stunningly beautiful, and quite durable, even for a life-time if the homeowner is careful to treat it with respect. There is something about an adobe floor that connects one directly with the earth. Even with shoes on you can feel the natural resilience that is missing with concrete; adobe is much easier on the body and soul. To read the rest of this article please go to this page at www.greenhomebuilding.com.